Sorry for the delayed update — Ally IS HOME!!!!! We broke free from the hospital Wednesday afternoon and are super, super happy to be home together as a family. I promise to post some pics soon of my beautiful girl. We welcome healthy visitors and invites to have some summer fun with family and friends. Ally continues to do VERY well with new trach. Goal is still to go home on Wednesday 7/28 after our home nurses are trained on our vent and observe her breathing treatment. Billy and I did our official “24 hour stay” this weekend to prove we can handle all of Ally’s care. We also celebrated our 13 year wedding anniversary on Sunday. Thanks for all your continued prayers and support. Pics still coming soon. Ally continues to do VERY well with her new trach and she has done well with pressure support trials, leading to a trach collar trial soon. While in the hospital we decided to have a surgery this past Tuesday to release her tendons in her ankles. She did AWESOME! Still dealing with quite a bit of hospital stress, but I must focus on the positive changes in Ally and the goal of going home around 7-28. There are also tons of POSITIVE things about this hospital stay and a TON of wonderful caring people who go over and beyond for Ally. Just wish I didn’t have bumps mostly due to personality conflicts and some staff not truly understand what it means to have a child with a chronic condition. I am determined to find a way to stay positive and remind myself that this was the best choice for Ally. Thank you to all those at the hospital and our family and friends for your support and prayers. Sorry it has been so long since I posted. I know many of you might have been worried. Thank you for your emails, cards, phone calls and most importantly prayers. Ally is doing SUPER, SUPER well with her new trach, but I have been dealing with a lot of extra stress when working with hospital management and their orders of how much I can be involved in Ally’s care and treatments as she transitioned from her ET breathing tube, to a new trach, then the sensitivity of it for 5 days until it was changed out, and now what “official” training process I MUST follow before being allowed to 100% care for my OWN child and as quickly as possible leave this hospital. Things are getting resolved but not without lots of tears and unneeded stress. What’s most important though, is Ally is doing AWESOME!!!!! This new phase of her and our life is a bit scary, but also exciting and I know 100% we made the right decision to trach her now. I’ll try to share more details and pics soon, but I better get some rest. Sorry for the delay….. Ally is doing AWESOME!!!!!!!! Trach surgery went very well and she was in the OR from 4-6 pm. First full treatment was done at 8 pm including her cough assist, IPV and vest with inline suctioning. She is really clear, so next treatment will be at midnight with ME doing part of it with one of our favorite RTs, Steve. Woooohooo! Ally seems to be happy and is watching her new Veggie Tale movie from Child Life. I’ll update more and share pics soon. Ally is beautiful with her trach and we are soooooooooooo happy she will never have to have a mask over her face again. Thanks a MILLION for all the prayers, well wishes and support!!!!!! God IS GREAT and we are also lucky to have sooooooooooooo many angels looking after Ally and our family! PSS – Our goal is to be home in 10-15 days (once me, Billy and my mom complete a shortened version of trach training). The usual time frame is 30+ days, but we already have so much knowledge and helpful experience from all of Ally’s previous non-invasive respiratory care. Ally is scheduled for her trach surgery at 4-4:30 TODAY!!! I still need to type out details why our family is choosing to trach Ally proactively (even though she is not bi-pap dependent and actually got over this illness quickly – once intubated). We would have been going home this week and is over her pneumonia, BUT a trach has MANY, MANY positives that will enrich Ally’s life and keep her out of the hospital. 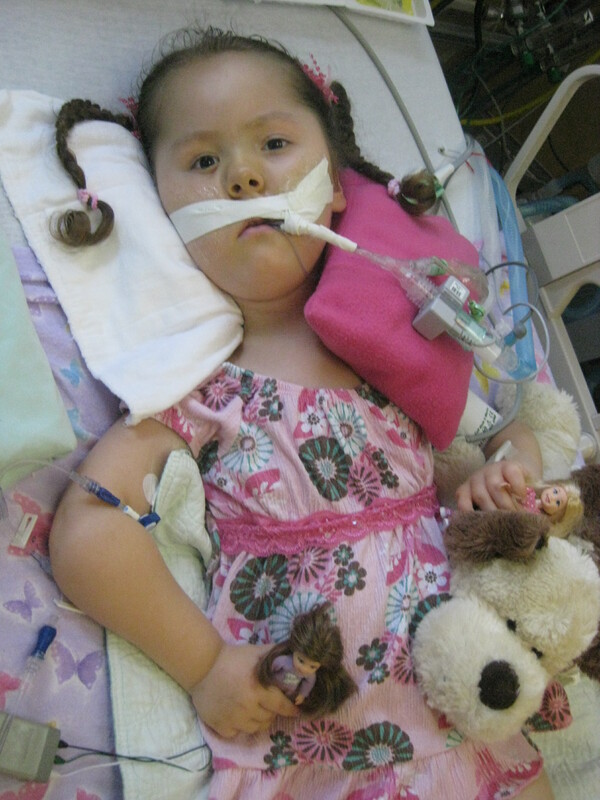 We are not choosing a trach because she is weaker, or closer to heaven. She only uses her bi-pap breathing machine to sleep, for a break, or full time when sick. We pray this will be the same for the ventilator. Some of the pros are: almost all illnesses will be able to be handled at home, no more masks or breakdown on Ally’s face, she will most likely gain movement and strength since she won’t be using all of her energy to breath, she will be more stable and healthier, she may be able to be more active with school and fun activities, it will be easier to staff nursing and train others to care for her….. There are some cons too, but we are positive this is the BEST for Ally. Please keep her and our family in your prayers and HAPPY thoughts as we make this positive transition. Thank you again for your friendships and support!!! !